The recent changes to Hunan TV have yielded lower ratings. The Years You Were Late pulled in CSM52 ratings of 0.4% for its premiere. All Out Of Love which started at 0.7% also fell into the same range after being moved to 10pm. 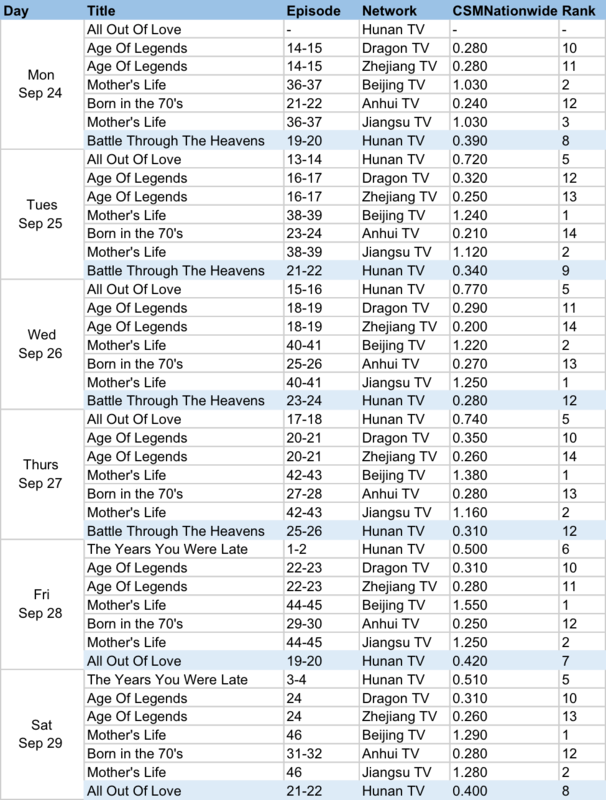 Battle Through The Heavens may have been suddenly pulled from the Friday lineup but it retains an average of 0.6% on TV. I think the show deserves more credit and has been gradually climbing the ranks to become the second leading drama online, just after Ruyi's Royal Love in the Palace. lET's Shake It Season 2 and Shadow of Justice are two web dramas that have just made the weekly top 10. Mother's Life doesn't seem to get as much love online as it does on TV, but it has reached a new high with CSM52 ratings of 1.9% on TV. Karry Wang from Eagles and Youngster tops the celeb rankings for the second week in a row. After being somewhat of a permanent mainstay, it may be the first time that I'm not seeing Zhao Liying on the list. This is a hard year for Hunan. "Battle Through The Heavens may have been suddenly pulled from the Friday lineup but it retains an average of 0.6% on TV"
ZLY made a really recent appearance. If she is really not pregnant, then she made a really bad choice to choose a very big long sweater which makes it seems as if she's trying to hide something. She was denying and denying it all along, but keeps reappearing with FSF, and now suddenly wear these type of clothes too. Maybe her fans felt betrayed and stop voting for her because of that, or, they just don't approve FSF. She was wearing the outfit that the brand was promoting. Pretty much had no choice but to wear that. People are so ridiculous. ZLY hasn't had any drama in over a year, the shocking part is that she continuously makes the top 10 without any activities. If ZLY is not dating FSF I wonder if she is also in the tax evasion fraud and just desperately trying to divert attention to her pregnancy rumor. Its like a fire candle news she wouldn't easily blow it completely out nor let it lit up bright, but must let it linger around. It's more safe to be off the top 10 list. The government is doing the tax fraud research on the most famous and highest paid actors.